Acts 11:19 They therefore who were scattered abroad by the oppression that arose about Stephen traveled as far as Phoenicia, Cyprus, and Antioch, speaking the word to no one except to Jews only. Acts 11:20 But there were some of them, men of Cyprus and Cyrene, who, when they had come to Antioch, spoke to the Hellenists, preaching the Lord Jesus. Acts 11:26 When he had found him, he brought him to Antioch. It happened, that for a whole year they were gathered together with the assembly, and taught many people. The disciples were first called Christians in Antioch. Acts 11:27 Now in these days, prophets came down from Jerusalem to Antioch. Acts 13:1 Now in the assembly that was at Antioch there were some prophets and teachers: Barnabas, Simeon who was called Niger, Lucius of Cyrene, Manaen the foster brother of Herod the tetrarch, and Saul. Acts 14:26 From there they sailed to Antioch, from where they had been committed to the grace of God for the work which they had fulfilled. Acts 15:22 Then it seemed good to the apostles and the elders, with the whole assembly, to choose men out of their company, and send them to Antioch with Paul and Barnabas: Judas called Barsabbas, and Silas, chief men among the brothers. Acts 15:23 They wrote these things by their hand: "The apostles, the elders, and the brothers, to the brothers who are of the Gentiles in Antioch, Syria, and Cilicia: greetings. Acts 15:30 So, when they were sent off, they came to Antioch. Having gathered the multitude together, they delivered the letter. Acts 15:35 But Paul and Barnabas stayed in Antioch, teaching and preaching the word of the Lord, with many others also. Acts 18:22 When he had landed at Caesarea, he went up and greeted the assembly, and went down to Antioch. Galatians 2:11 But when Peter came to Antioch, I resisted him to his face, because he stood condemned. 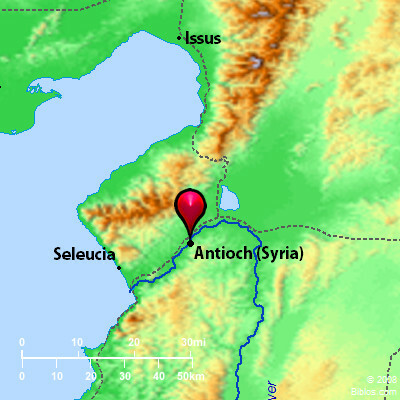 (2) Antioch in Syria.-In 301 B.C., shortly after the battle of Ipsus, which made him master of Syria, Seleucus Nicator rounded the city of Antioch, naming it after his father Antiochus. Guided, it was said, by the flight of an eagle, he fixed its site on the left bank of the Orontes (the El-`Asi) about 15 miles from the sea. He also rounded and fortified Seleucia to be the port of his new capital. The city was enlarged and embellished by successive kings of the Seleucid Dynasty, notably by Seleucus Callinicus (246-226 B.C. ), and Antiochus Epiphanes (175-164 B.C.). In 83 B.C., on the collapse of the Seleucid monarchy, Antioch fell into the hands of Tigranes, king of Armenia, who held Syria until his defeat by the Romans fourteen years later. In 64 B.C. the country was definitely annexed to Rome by Pompey, who granted considerable privileges to Antioch, which now became the capital of the Roman province of Syria. In the civil wars which terminated in the establishment of the Roman principate, Antioch succeeded in attaching itself constantly to the winning side, declaring for Caesar after the fall of Pompey, and for Augustus after the battle of Actium. A Roman element was added to its population, and several of the emperors contributed to its adornment. Already a splendid city under the Seleucids, Antioch was made still more splendid by its Roman patrons and masters. It was the "queen of the East," the third city, after Rome and Alexandria, of the Roman world. About five miles distant from the city was the suburb of Daphne, a spot sacred to Apollo and Artemis. This suburb, beautified by groves and fountains, and embellished by the Seleucids and the Romans with temples and baths, was the pleasure resort of the city, and "Daphnic morals" became a by-word. From its foundation Antioch was a cosmopolitan city. Though not a seaport, its situation was favorable to commercial development, and it absorbed much of the trade of the Levant. Seleucus Nicator had settled numbers of Jews in it, granting them equal rights with the Greeks (Ant., XII, iii, 1). Syrians, Greeks, Jews, and in later days, Romans, constituted the main elements of the population. The citizens were a vigorous, turbulent and pushing race, notorious for their commercial aptitude, the licentiousness of their pleasures, and the scurrility of their wit. Literature and the arts, however, were not neglected. In the early history of Christianity, Antioch occupies a distinguished place. The large and flourishing Jewish colony offered an immediate field for Christian teaching, and the cosmopolitanism of the city tended to widen the outlook of the Christian community, which refused to be confined within the narrow limits of Judaism. Nicolas, a proselyte of Antioch, was one of the first deacons (Acts 6:5). Antioch was the cradle of GentileChristianity and of Christian missionary enterprise. It was at the instance of the church at Antioch that the council at Jerusalem decided to relieve GentileChristians of the burden of the Jewish law (Acts 15). Antioch was Paul's starting-point in his three missionary journeys (Acts 13:1; Acts 15:36; 18:23), and thither he returned from the first two as to his headquarters (Acts 14:26; Acts 18:22). Here also the term "Christian," doubtless originally a nickname, was first applied to the followers of Jesus (Acts 11:26). The honorable record of the church at Antioch as the mother-church of GentileChristianity gave her a preeminence which she long enjoyed. The most distinguished of her later sons was John Chrysostom. The city suffered severely from earthquakes, but did not lose its importance until the Arab conquest restored Damascus to the first place among Syrian cities. Antioch still bears its ancient name (Antakiyeh), but is now a poor town with a few thousand inhabitants. AN'TIOCH (pron. an'ti-ok); there are two cities of this name mentioned in the N.T., one in Syria, about 290 ms. n. of Jerusalem where the disciples of Christ were first called Christians'; it is now a village of about 6000 or a few more inhabitants, 15 ms. from the Mediterranean; the other was in the extreme n. of Pisidia, on the s. side of a mountain range 502 ms. n.w. from Jerusalem and in Asia Minor. It is an inhabited town with many ancient ruins.